Save the date! The 2008 Fat Tire Fest will be held on October 12, 2008. CORBA is awarded $10,000 Grant from Bikes Belong For the Mount Hillyer Technical Trail Project! Mix up your work week a bit on Friday to get outside, do some volunteer work and make a heavily overgrown trail ridable. We will be doing some much needed tread and brush work to clear out the invasive mustard plants. We started near the Bark Park trail on April 17 and made it in 0.7 mile. The Mountains Restoration Trust has had their crew on the trail doing brush removal as well. Start time and specific location is to be determined on Thursday after coordinating with MRT's crew. If you can make it please RSVP to Hans at trailcrew@corbamtb.com. Visit the CORBA Calendar at www.corbamtb.com for time and directions. 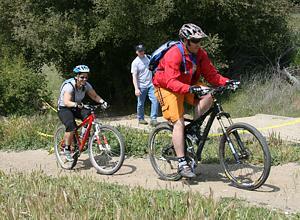 Thanks to CORBA trails are open to bikes! Sponsored by CORBA and REI - Lunch and water will be provided for the first 50 people who sign-up. Tools and gloves will be provided, however, it is recommended that you bring your own gloves, water, and sunscreen. Long pants and good shoes required. Our trail work efforts have given cyclists respect throughout the community. We need to show that we are committed to maintain and repair our trails through volunteer work. If you can't make it, find someone who can. No excuses! Sign in as CORBA or something that indicates you are a mountain biker. More details and directions on the Calendar at www.corbamtb.com. Your help is needed for post-fire restoration of the trail prior to the 100th anniversary of the Mt. Wilson Trail Running Race. 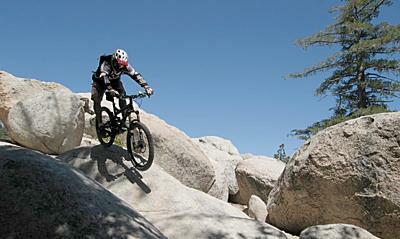 The Mount Wilson Trail is a wonderful running and MTB trail. The trail was in great condition before the recent fire and needs you help to bring it back. This a great chance for Mt bikers, runners and hikers to work together for the common good. There is a lot of McLeod and shovel work to do. We need to cover about a mile within the next week. Visit the CORBA Calendar for more info at www.corbamtb.com. Sponsored by REI and CORBA at Canyons helping to maintain the trails. Details to follow on the CORBA Calendar. This is mainly an out (up) and back (down) ride and mainly on single-track. Most of the trail is exposed, and there is little shade throughout the ride. However, this is a great single-track trail, all but a few feet rideable. The ride is about 22 miles, 4700 ft. of climbing and should take about 5 hours. Bring plenty of water and snacks. Saturday June 7 is the next skills clinic. Ralphs card members donate to CORBA when you shop. Visit our Ralphs News news article for details. Albertsons card members can donate too. Visit our Albertsons News news article for details. Also valid for Sav-On and Osco drug stores. Donate to CORBA when you search online. Visit our Goodsearch news article for details. Add goodsearch to your toolbar.